This interesting Scottish name is of uncertain origin but is probably a locational name, despite appearing to be patronymic. The development seems to be from Maurice Acarson, bailiff of the isle of Man, but this is uncertain. What is certain is that 'the Corsans or Carsans were an ancient Galloway family whose lineage ended in the direct line of James IV in the late 15th Century. 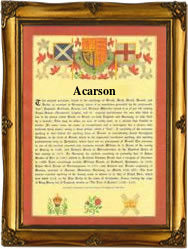 The Carson's were provosts of Dumfries for several generations in the 16th century, and were also prominent in the local affairs of Kirkcudbrightshire. The early name holders were known for their ferocity, and in 1305 John a'Carson and his followers seized the castle of Dumfries. Their later fate is not known, although in 1503 Andrew Akersane was 'respited' for his part in burning Dunskay House. Rather against the trend two of the name bearers listed in the Dictionary of National Biography were ministers, although Kit Carson the famous Indian scout is rather more true to form, whilst Joseph Carson, in 1776, a Philadlephia merchant, born in Scotland, gave considerable assistance to the American Independence movement. The coat of arms includes the blazon of a silver field, a chevron between three red crescents, and the crest of an elephants head. The first recorded spelling of the family name is shown to be that of Sir Robert de Carsan, which was dated 1276, in the "Records of Holm Cultram", Scotland, during the reign of King Alexander 111 of Scotland, 1249 - 1286. Surnames became necessary when governments introduced personal taxation. In England this was known as Poll Tax. Throughout the centuries, surnames in every country have continued to "develop" often leading to astonishing variants of the original spelling.